I'm just finishing up reading the most recent edition Bob McCarthy’s Sound System Design & Optimization. It has been hugely informative in an "explaining the things you've started to notice but couldn't explain yourself" kind of way. I'd highly recommend it to, well, basically everyone who does sound. But there's something I haven't been able to quite understand: how do you determine the "midpoint depth" of a space when setting up microphones for system optimization? Say you have a Left-Right pair of main speakers in a space with a raked audience. The speakers are in the air above the downstage corners of the stage. Horizontally they're angled in to maximize uniformity of coverage, creating an uncoupled point-destination array. Vertically, there's a 2:1 distance ratio between the closest and furthest seats, so the speakers are aimed at the most distant point. So, here's the problem: nowhere in the book can I find a thorough discussion of what constitutes the "midpoint depth", and without it I can't place more than half of those microphone positions. From the description, I know that it varies with asymmetrical coverage (so, for example, it tends toward the VTOP position as the slope of the audience increases), and from the diagrams appearing with the examples it looks like the midpoint depth might vary for ONAX vs. OFFAX, but that's about as far as I've gotten. What I'm looking for is some relatively hard-and-fast rule for determining midpoint depth in a particular space, something like "equal to the average of the distance to the speaker from VTOP and VBOT". I'll admit to not having yet read all of the examples in the "Applications" chapter of Mr. McCarthy's book, but from the introduction to that chapter, it seems like I need to understand all of the basic concepts (such as midpoint depth) to be able to comprehend that final chapter, so I'm not hopeful that my question will be answered by the end of the book. Can someone help me out with this? I feel like there has to be some formula that can at least put me in roughly the right spot. Re: Confusion about "Midpoint Depth"
I would not be concerned with trying to "find the correct spot". In a decent system, the response should be close to equal everywhere. If it is good in just the "right spot", then the system as a whole is worthless. The goal should be equal sound for everybody. I like to take measurements at the bad spots and good spots. They should be very close. This includes the front row-the rear row-the outside corners and in the middle of each speakers coverage area. In plan view, midpoint depth is the center of the FAR shape e.g. for a stereo or point destination setup this often is the geometrical center of the venue at 50% width and 50% depth of the seating area. In a dual-mono approach it will be the same depth but at 25% and 75% width respectively. In section view, midpoint depth is the middle between VBOT and VTOP. In general in both views it implies the middle between start en end of coverage. That's what I would have thought, but some of the diagrams in the book seem to contradict this simplicity. Maybe I can illustrate my confusion more clearly with an image from the book. 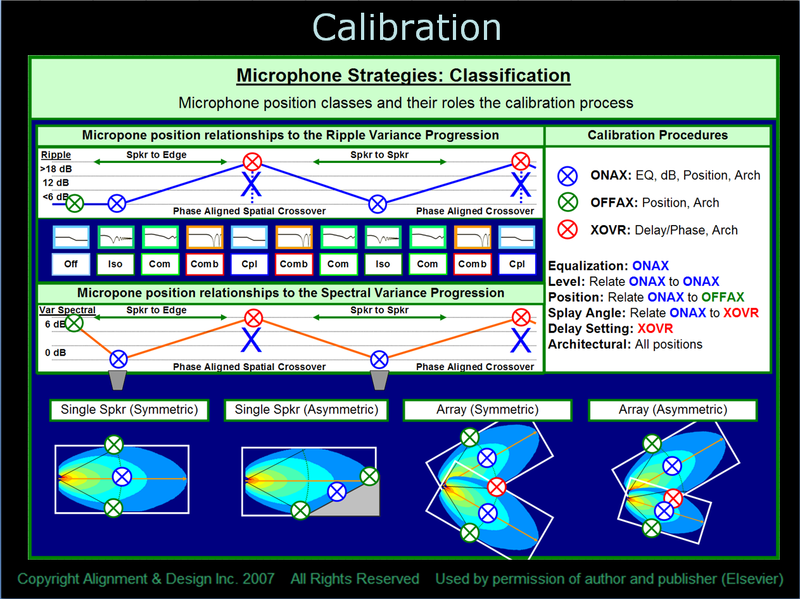 In the "Single Spkr (Symmetric)" diagram at the bottom left of the image, we see pretty typical plan view of a speaker coverage. The ONAX position uses the midpoint depth you described at the centre of the FAR shape, but the OFFAX positions are closer than the geometric centre of the FAR shape. How is their position being determined relative to the ONAX depth? Would a crossover position in an uncoupled array use the same depth-determining methodology as the OFFAX? More confusing, though, is the "Single Spkr (Asymmetric)" diagram, representing a typical section view. In this diagram the ONAX position is offset to be a little closer to the VTOP position than the VBOT position. The text explains why this is (due to the slope of the audience) but doesn't go into any more detail. How is this offset midpoint determined? This seems especially important since, judging by later examples, it appears to be the section view midpoint (and not the plan view FAR centre) that is ultimately used to determine the ONAX depth for hanging main speakers in a space with a raked audience. Does that make sense, or am I really missing something here? In the first illustration OFFAX plan view is equidistant to the speaker where we observe 6- dB of angular attenuation. This is the radial definition of coverage angle. In practice however it suffices to think perpendicular instead of radial. We call it LAR or Lateral Aspect Ratio which also results in -6 dB points as well. ONAX plan view is floating in space (drawing plane), residing in the propagation plane of the the speaker. It's kinda misleading because our audience sits along the minimum variance line which is apparent in the section view where ONAX is actually further to the back in the middle between VBOT and VTOP. Minor apparent deviations result from these illustrations being drawn in Microsoft Excel. These are not actual predictions from e.g. Mapp XT. They serve to illustrate concepts. Ah, okay, I was wondering if that was the radial variance line. Good to know that, for calibration purposes, radial OFFAX vs. lateral OFFAX doesn't make a huge difference. That all makes a lot of sense. Just to confirm, then, when determining the midpoint between VTOP and VBOT, the goal is to be equidistant between those two positions in the plan view (e.g. in the plan view, ONAX is located 3 m from VTOP and 3 m from VBOT along the on-axis forward variance line), right? Then, once this midpoint is established, the midpoint depth of the OFFAX and crossover positions should be somewhere in between the radial and lateral variance lines extending perpendicular to the forward variance line at ONAX? Perhaps I'm worrying about this all too much?